Has the summer left your skin feeling dry, dull and damaged? The fall is the perfect season to repair this damage through a chemical treatment. Chemical peels have quickly become the go-to method to treat various skin conditions such as skin dullness, aging and acne, and are now available in retail! The Derm Renewal Cream and Booster are the newest products to join our retail selection. These products make it easy to maintain a flawless complexion in the comfort of your home. 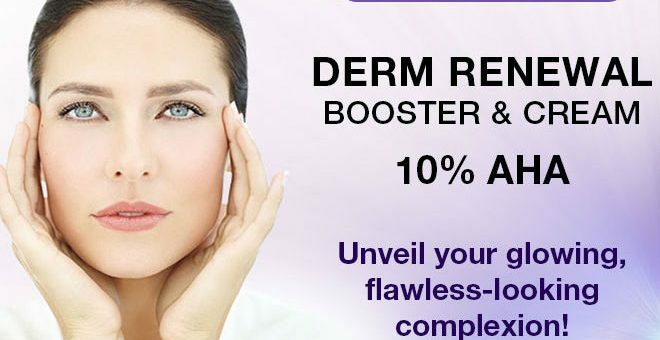 The Derm Renewal Cream and Booster both contain 10% AHA . The Glycolic and Lactic Acids in the product improve skin texture, brightness, and radiance. Come in now for a free consultation to see which product is more effective for your skin condition.